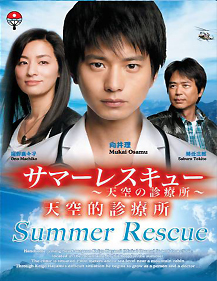 Hayami Keigo is a promising young heart surgeon at a university hospital, but is made to examine patients at a clinic in the mountains during summer on the orders of his superior. At a harsh environment 2,000 m above sea level, there is a very small quantity of testing equipment and medicine. It is a culture shock and setback for Keigo who is active in advanced medical care and the use of cutting-edge equipment. This is a place detached from modern medical care where doctors make all diagnoses by touching, looking at and talking to patients. Koyama Haruka was raised by parents who ran a mountain lodge, but when she was 5, her mother died in an accident on the mountains. That influenced her to become a nurse in Tokyo. However, one day, an incident prompts her to escape from Tokyo and return to the mountain lodge. It is the same time that Keigo arrives at the clinic.